Our family has made a significant investment in a dedicated home theatre. 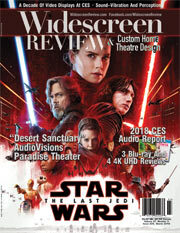 Upon reading nearly every other home theatre publication, I have found that Widescreen Review has consistently provided us accurate reviews, and as such have built a substantial library of movies and equipment, which we consider “Keepers.” I find the equipment reviews, especially the Subwoofer Special Edition, to be right on the money and a must-have. The video equipment reviews (we are currently in the market for a front projector) are educationally based as well as comparatively based, so I learn about equipment in general while I can compare specifications. I thank you for a publication well worth the cover price issue after issue.